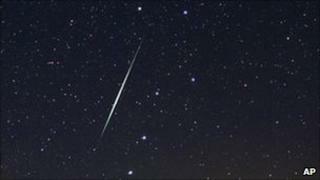 A spectacular meteor display was watched for overnight at the UK's first Dark Sky Park in south west Scotland. In clear, dark conditions up to two of the Geminid meteors per minute were expected to be visible, although some were likely to be faint. The special "watch" was arranged at the Galloway Forest Park late on Monday evening. Astronomers said it would be among the best places to view one of the "major shows of the year". The brightest meteors appear as yellowish streaks that seem to radiate from the constellation of Gemini. Although the shower's peak occurs at around 1100 GMT on Tuesday, it may be possible to catch the spectacle during dark periods any time up to Wednesday morning. By 0200 GMT on Tuesday the "radiant" - or point of origin of the meteors - was almost overhead in the UK. The Geminids consist of tiny particles ranging in size from a grain of sand to a pea shed by 3200 Phaethon, an object thought to be an extinct comet. As the Earth crosses their path they hit the atmosphere at about 22 miles per second and burn up. A dramatic "fireball" with a green trail that shot across Britain last Wednesday may have been an unusually large Geminid meteor arriving early. Robin Scagell, vice-president of the Society for Popular Astronomy, said: "The Geminids are certainly going to be one of the major shows of the year, and there's a good chance it will be a fine display. "The forecast is for up to 120 meteors per hour, but that's under perfect conditions." A spokesman for the Royal Astronomical Society said the Dumfries and Galloway venue could be an ideal spot to watch the meteors. "As with most astronomical events, the best place to see meteors is at dark sites away from the light pollution of towns and cities," he said. "In good weather, rural sites such as Galloway Forest Dark Sky Park in Scotland are potentially excellent locations to see the Geminid shower." The site, which became Britain's first Dark Sky Park last November, held a meteor watch starting with a talk at 1900 GMT with observation beginning two hours later. The Geminids will also feature in Meteorwatch, a Twitter event that allows observers under clear skies to share images and videos.